A Tunisian crochet hat that isn’t seamed and doesn’t require a double-ended hook and use of multiple balls of yarn at a time? Yes, please! The eyelet pattern is sandwiched between sections of Tunisian simple stitch, making it a cinch to follow if you know the techniques. You will want to be comfortable with Tunisian crochet and crochet in the round, so you can follow the pattern. For extra help with Tunisian crochet in the round, see the tutorial. Gauge Swatch: 3’’w x 2’’h (7.5 cm x 5 cm) ch 12. Special Instructions: As the decrease rounds get smaller, you will have to distribute stitches around the cord as shown here. 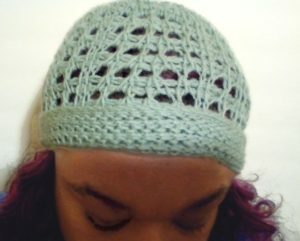 This entry was posted on Wednesday, March 29th, 2017 at 12:00 AM by Candace	and is filed under Free Crochet Patterns. You can follow any responses to this entry through the RSS 2.0 feed. You can skip to the end and leave a response. Pinging is currently not allowed.